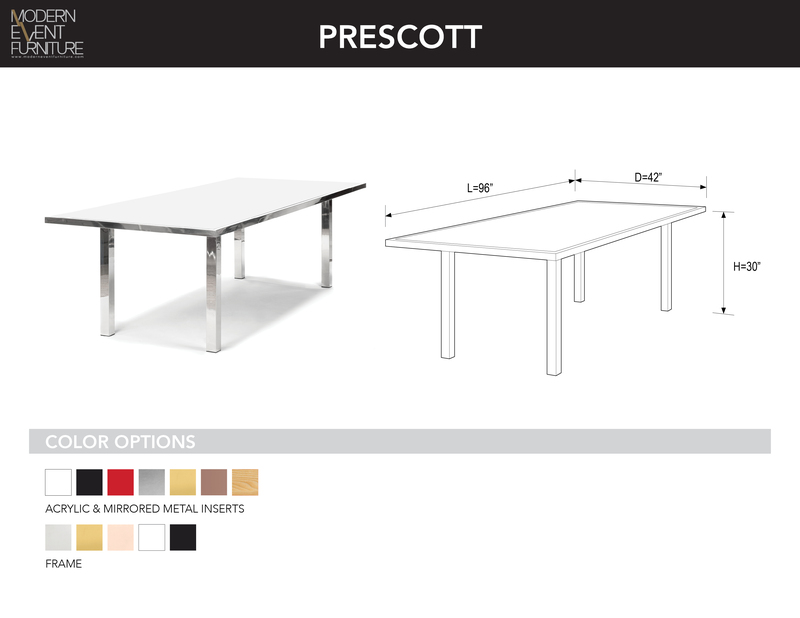 Extra Prescott Frame - MEF Modern Event Furniture Inc.
RECTANGULAR DINING TABLE FRAME WITH COLLAPSIBLE RECESSED STRAIGHT LEGS. SEATS UP TO 10 PEOPLE. OUR DINING TABLE COLLECTION WILL SOLVE ALL YOUR NEEDS WHETHER YOUR EVENT BE AN INTIMATE DINNER FOR 50 OR A CORPORATE LUNCH FOR FIVE HUNDRED. WITH THREE LEG VARIATIONS AVAILABLE, YOUR TABLE CAN BE CHANGED FROM DINING TO COMMUNAL HEIGHT WITH THE CLICK OF A BUTTON OR YOU CAN USE THE SILHOUETTE LEG TO GIVE A SOFTER, MORE ROMANTIC LOOK TO YOUR TABLE. COMPATIBLE WITH ALL MEF CHAIRS OR STOOLS.